The N 100 PCB Nibbler for routed Printed Circuit Cards is ideal for low to medium volume production or as back up for your expensive capital equipment. 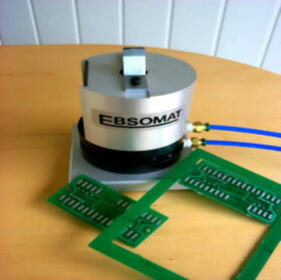 The NIBBLER SINGULATION TOOL separates routed PCBs carefully and economically. With a pneumatic operating tool, the strips are separated without any residues and the PCB is cut out. The PCB is led with the milled slot over the cutting tool. The strip is moved under the cutting knife and by pressing the foot valve the strips are separated. The cut tabs are accumulated inside the Nibbler and can be discarded at operator’s convenience.